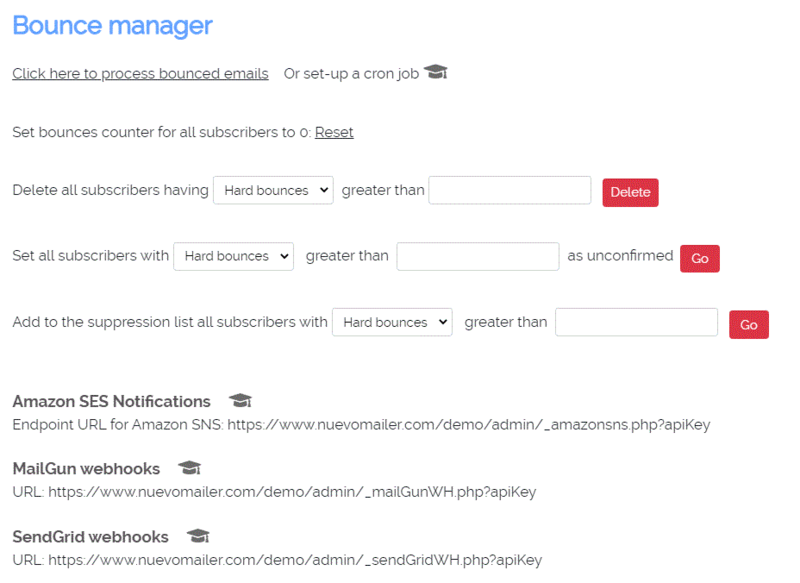 You can process bounced (returned) emails resulting from your campaigns. It identifies and flags the related subscriber accounts. It does not delete subscribers. You decide who/when to delete or suppress. It updates the campaign statistics so you can see a "Campaign bounce rate". You can initiate the mailbox processing either manually or automate it using a cron job. It works with the IMAP protocol. It reads and scans the mailbox where bounces go. Un-deliverable, bounced or returned email are equivalent terms. You can also process bounces and complaints from Amazon SES. The endpoint script and step-by-step set-up instructions for Amazon are provided. Learn more. Detects soft, hard bounces and automatic responses. Highly configurable: each un-deliverable email is scanned and compared to a collection of bounce reasons included in a simple xml file. A returned email may contain various descriptions (reasons) of why it bounced depending on the mail agents used in the communication process. You can edit the xml file, add more reasons or change what should be regarded as soft or hard bounce. The most common bounce reasons and numeric error codes are included in the file. Multi-language. The returned emails usually contain numeric error codes. But there are cases where such a code is missing and instead you find a bounce description in a language other than English. With this approach you can add your own bounce descriptions in the language of your choice in the xml file. According to Amazon Simple Email Services guidelines, If your bounce rate is higher than 5-6% then you are in the danger zone of getting blacklisted. This also applies to other major email account providers. By removing subscribers who bounce you maintain a clean mailing list. You will get less bounces in the next campaign. This will result in improved deliverability: ISPs do not like to receive emails that will bounce. Therefore you minimize the chances of having your IP or email getting blacklisted and thus having your newsletters rejected as spam. Your tracking reports become more accurate. Overall, your email marketing effort becomes more focused. At the bottom of your configuration settings in your nuevoMailer administration panel you will find the following. What you actually do here is to define an email account (mailbox) where bounces will be sent and the settings required to open and read it. When the mailbox contains thousands of messages, in order to avoid time-outs, you may set the "Number of messages to process in a single run". if you want to process the mailbox manually you click at "Click here to process bounced emails". The cron job does exactly the same. It is advisable here to look both at your Home page and your campaign reports and verify that subscribers were updated. Every subscriber has two counters: soft and hard bounces. The processing only updates the related subscribers. You can then delete or suppress or set an un-confirmed the subscribers according to their soft/hard bounce values. It is not advisable to immediately update a subscriber whose email address soft-bounced once. Instead a good rule of thumb is to suppress subscribers having at least 2 soft bounces or 1 hard. By suppressing subscribers you still keep them in your system but exclude them from future campaigns.